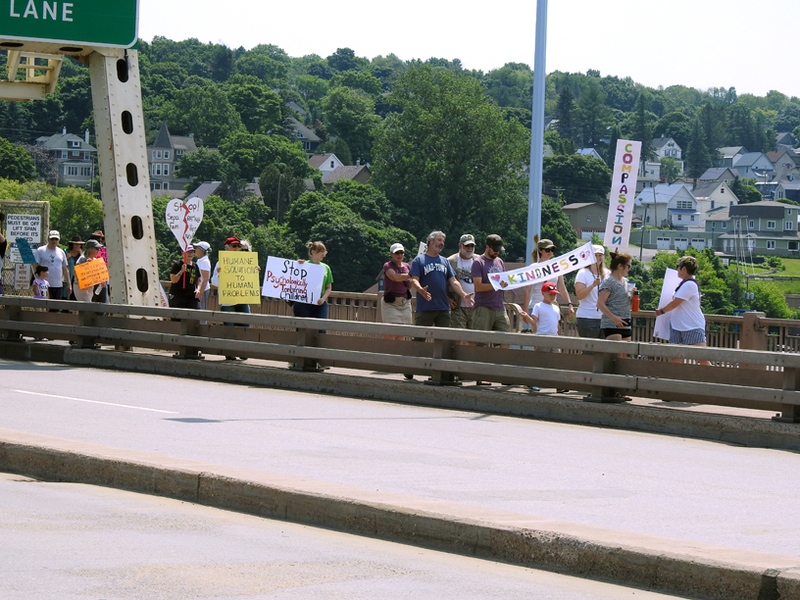 Garrett Neese/Daily Mining Gazette Marchers walked across the Portage Lake Lift Bridge (below) to protest the separation of migrant families at the border Saturday. 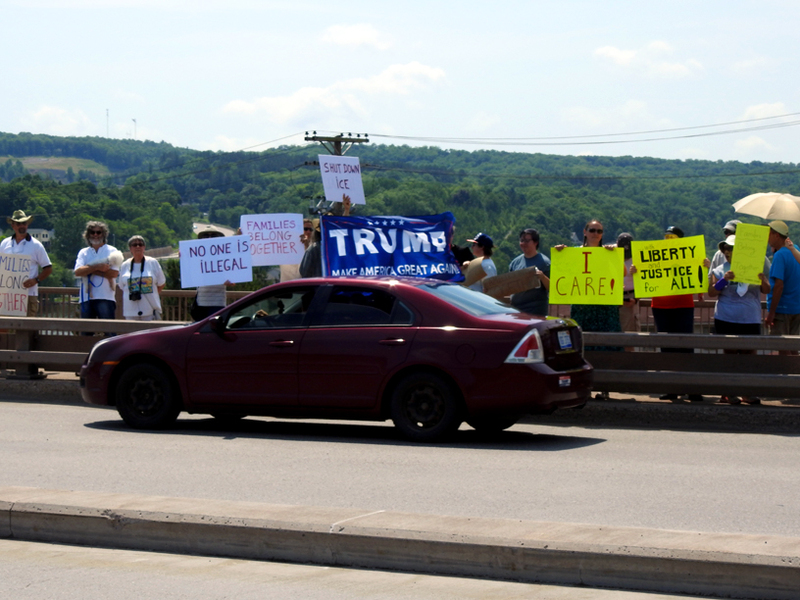 HOUGHTON — About 90 community members hoisted signs and marched across the Portage Lake Lift Bridge Saturday in opposition to President Donald Trump’s immigration policy. The protesters demanded the reunification of migrant families separated at the U.S.-Mexico border. The march was one of more than 700 protests conducted across the country, including more than 20 in Michigan. A U.S. District Court judge ruled Tuesday the administration had to reunite all families within 30 days. In a court filing Friday, the U.S. Department of Justice said it would keep families together in detention until their cases are concluded. 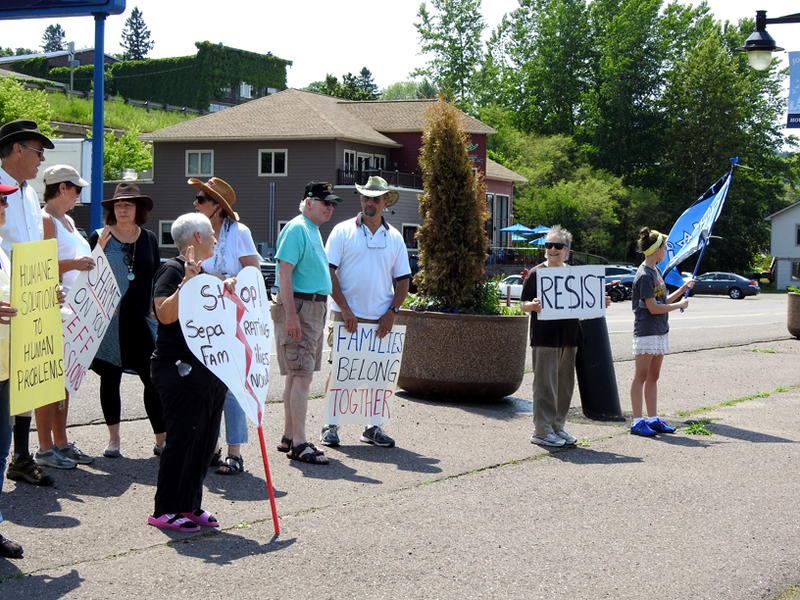 Garrett Neese/Daily Mining Gazette Marchers displayed signs for travelers on the Ranger IV before proceeding across the Portage Lake Lift Bridge to protest the separation of migrant families at the border Saturday. Ehl hoped courts would continue to recognize the 2015 order barring children from being detained for more than 20 days. She said the Trump administration has more humane — and cheaper — methods available. 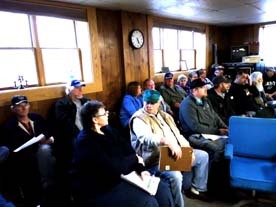 The Family Case Management Program of the Immigration and Customs Enforcement (ICE) agency costs taxpayers about $36 per day to detain an asylum seeker, ICE Director Thomas Homan testified to Congress in 2017. The “tent cities” in which children were staying cost $775 per night per child, according to a June NBC News report. Reports for other detention centers ranged between $250 to $300 per night. 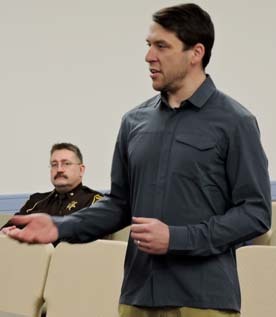 “I would like to see enough voices raised that we can prevent family jails from happening, and we can return to effective programs that allow immigrants to move through the system that we have in place safely that allows for due process for everyone in this country and keeps children from being tortured,” Ehl said. Garrett Neese/Daily Mining Gazette A car waving a “Make America Great Again” flag drives past a group of protesters on the Portage Lake lift Bridge during Saturday’s march against the administration’s immigration policy. Responses were mixed, including pro-Trump cheers as well as appreciative honks and thumbs-up for marchers. Response from passing drivers was divided. Supporters honked and gave thumbs-up. Others yelled pro-Trump slogans. A car with a “Make America Great Again” flag made several passes across the bridge. Sharon Eklund of L’Anse was thinking of her grandchildren, ages 11, 9 and 3. Regardless of people’s ethnicity or religion, people should be willing to help them, said Bennett Novak of Mohawk.